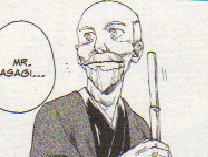 Asagi is Itsuki's grandfather. He allowed Tobei to live with him and his family, Itsuki and her mother, but only if he works. He has some concerns for the boy.